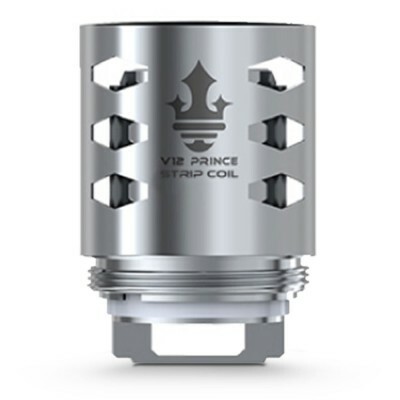 These large decuple coils come with five coil holes inside and and four air holes. The slightly lower resistance of these coils compared to other Prince coils means these are great for vapour clouds. The coils come with a scratch and check authenticity sticker so that you can confirm the coils are genuine Smok. 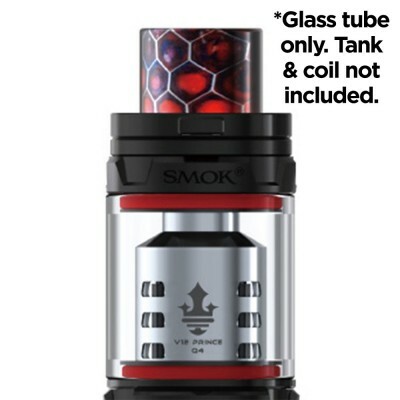 Smok P-Tank T10 coils are best used by more experienced vapers who are looking for large clouds of vapour and intense flavour. 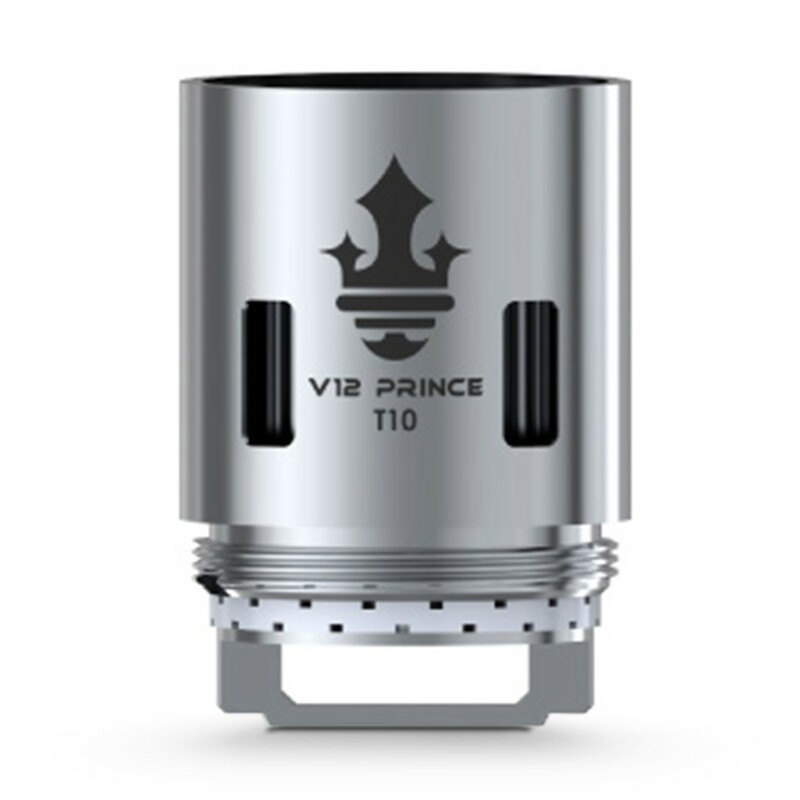 Smok V12 P-Tank T10 Coils are compatible with the V12 Prince tank, V12 Prince Cobra Edition tank and Resa Prince tank. They are ideal for use with a mod capable of firing up to 110 watts in order to maximise their potential. As with all coils, but especially those rated below one ohm (sub-ohm coils) it’s important to prime these before using. 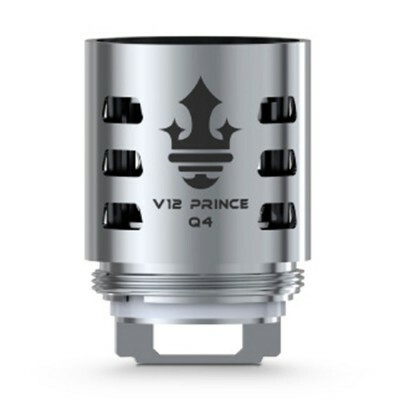 Simply drip some e-liquid into the coil holes, and, after attaching to your tank, allow to stand for a few minutes. See video below for a visual guide! 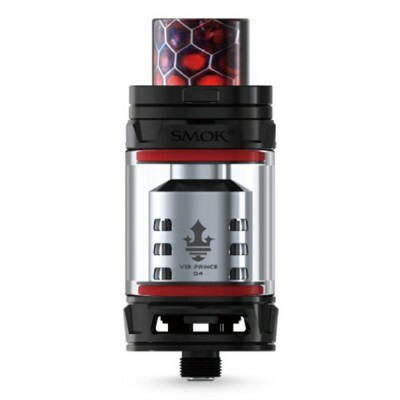 At their limits the coils can be used with a wattage range of 60-120 watts, but Smok recommend a best range of between 80 and 110 watts. Using above this range increases the risk of a burnt coil. At ECigaretteDirect we pride ourselves on providing you with superb after-sales support, and aim to provide rapid replacements for any faulty device under warranty. This page details the warranties you get with your device, and how to get a replacement. Your charger comes with a 12 month warranty. All mods and batteries are under warranty for three months. All clearomisers (tanks) with the exception of CE5 clearomisers are under warranty for six months. CE5 clearomisers (tanks) are under warranty for one month. Please note - these warranties do not apply to the coil within a clearomiser or tank which is a consumable product as below. Coils are a consumable product, and as such, will be replaced only if faulty on arrival. Please let us know within 5 days of receipt if your new coil does not work. What does your warranty mean? The above warranties are subject to our terms and conditions. Please click here for further information. What if the warranty has run out? We're still here to help! Many problems can be diagnosed and solved (or we can point you towards one of our helpful guides), so send us an email, give us a call for advice or pop into one of our stores for face-to-face support and help. How do I get a replacement? You’ll need to return the item (we can arrange pick up free of charge). If we are unable to diagnose and solve your issue, we’ll send you a replacement by Royal Mail First Class. It helps if you have your order number, but if not our team should be able to find your order using your email address. At ECigaretteDirect we understand delivery speed is incredibly important. After all, if you’ve switched from cigarettes to vaping, you don’t want to wait for your vape! That’s why if you place an order before 3pm Mon-Fri, it’ll be shipped the same day. What’s more, if you place an order over £20.00 you get FREE delivery. 1-2 working days if purchase completed before 3pm. Parcels ship Monday - Friday excluding bank holidays. 95% of orders arrive next day. Signature required for orders over £40.00. Orders over £40.00 are sent by recorded delivery. Parcels ship Monday - Friday excluding bank holidays. Delivery times 9-21 days depending on country. See here for countries we deliver to. Unfortunately, we can no longer deliver to addresses outside the UK but in the EU due to new EU regulations. Need to return an item? We aim to make the process as easy as possible (it’s also free!). We can arrange for a free pickup or for your product to be sent back free of charge. There’s no need to fill in a complicated form - just send an email to our friendly customer service team on [email protected], give us a call on 01792 852843 or use this contact form. When can I make a return? When you have an unwanted present or have changed your mind - you’ve got 90 days to decide! Please note this only applies when you have not used the product, and it is in a resalable condition. You have a faulty product under warranty. You can see our full returns policy in our terms and conditions here. We also ship internationally, including Australia and New Zealand. You can see the full list of countries here. At E-cigarette Direct we only sell e-liquids that have been fully tested for impurities such as diacetyl. Our own range, Halo Vapour Co., is produced in the UK from top quality ingredients, sourced in the EU wherever possible using the very best pharmaceutical grade nicotine, and tested in a UK, government approved laboratory. If you want to know what's in your e-liquid, just click here to view our testing certificates. You have to be over 18 to purchase from this website. Nicotine containing products are addictive and are not recommended for non-smokers, persons who are allergic/sensitive to nicotine; pregnant or breast-feeding women; persons who should avoid using nicotine products for medical reasons; or persons with an unstable heart condition, severe hypertension or diabetes. Please keep e-liquid and nicotine containing products out of reach of children and pets. Why do I have to prove my age? To our website you look under 18. So, as a responsible retailer, we need to check your age. You'll only need to do this once and it takes less than a minute. Our age verification system is quick and easy to complete. Simply enter your date of birth, and our system will use the information from your order to do the rest. On rare occasions, you might find that you don’t succeed on first try. Don’t worry - our super-friendly customer service team is on hand to ensure that, as long as you are 18 or over, you can still get your vaping supplies! Once you have confirmed your age we won’t usually need to check again. (Exceptions can occur, for example if you change your name). Your age is checked using Experian, which will check the information you provide against information in existing records to confirm you are over 18. No credit check is performed but a record of the search will be visible to you on your credit report. This will not affect your ability to get credit. Why do we check age? As you may know, there has been some concern that under-18’s may try vaping. This is against both our company policy and the law. And as responsible retailers, we need to do everything we can to ensure that every customer is of legal age. For more information, see our Terms and Conditions. How Secure is e-Cigarette Direct? Your privacy is important to us, and your personal information should remain just that - personal. See the little green lock in the search bar? That’s our security certificate (SSL or secure socket layer to be precise). It encrypts all the information you enter so that no-one else can see it. Information you provide for age verification is sent securely to Experian and no details of the checks are stored in our system. Ever. If you have any concerns, please call our friendly customer services team on 01792 852843 (Mon - Fri, 9am - 5pm). For the techies: Our SSL certificate uses an sha256 hashing algorithm. Halo Short Fill E-Liquid | Halo Vapour Co.